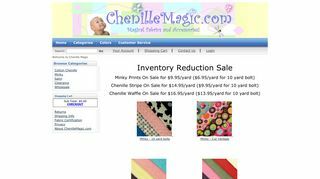 Chenille Magic – Offers Chenille fabric as well as clothing for women and children. Also bedspreads, accessories and notions. – Offers Chenille fabric as well as clothing for women and children. Also bedspreads, accessories and notions.